Appliance Repair You Can Trust! As part of our commitment to customer service, we at A-Appliance Xperts, Inc. felt it was important to explain to you how are charges and services work. A-Appliance Xperts Inc charges a one-time service charge of $70 for the initial service appointment and diagnosis. (Excluding microwaves and commercial appliances, which is a $90 Service Charge). 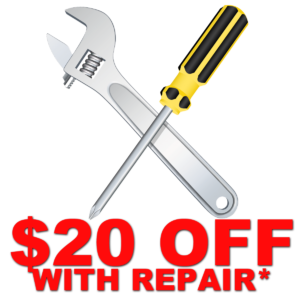 This $70 Service Charge is free, if you agree to continue with the repair made to your broken major appliance. Our Service Charge covers diagnosis for up to three appliances; after that limit, there is an additional $20 Service Charge, per appliance. Basically, this is the minimum charge for our professional technician to come out, analyze, and determine the problem with your appliance. In the time allotted we will diagnose, provide options and also consult with you on whether or not your appliance is even worth repairing OR replacing. You may ask,“So you charge me $70 just for walking in the door?” The answer is, the $70 service charge is related to the time and cost it takes for our repair technician to travel to the customer’s home or business, and drive a vehicle that is fully-loaded with the most common breakdown parts and tools. You add that to the fuel cost, and the time it will take the technician to successfully diagnose the problem of your appliance, and you can see why the $70 service charge is necessary. Once again, if you decide to proceed with the repair of your appliance, the Service Charge is FREE and you will only pay for parts and labor. For any additional appliances diagnosed, beyond the 3 you are initially entitled to, $20 is added to your invoice. At A-Appliance Xperts Inc, we are committed to providing all of our customers with upfront pricing and high quality customer service. We strive to be your trusted experts on broken appliances. We offer over 35 years of professional technical experience, and as such will work with you in your decision to repair vs replace your troubled appliances. The parts and materials to repair and refurbish your broken appliance is the lifeline of the appliance repair business. We stock the most commonly-used parts and supplies in our vehicles to fix your appliance problem on the spot. The cost of the item includes the price to inventory the item and to keep it in stock, including ordering the item, freight, handling, delivery from supplier, and the warranty. A-Appliance Xperts will try to keep the cost of parts, materials, and supplies to a reasonable minimum, that way we pass along the savings to our customers. Appliance repair technicians are highly developed and skilled tradesmen. The art of appliance repair requires a familiarity of electronics, mechanics, engineering, plumbing, and technology. They have the expertise, education and know how to repair your appliance in confidence. Continuing education is maintained through constant yearly update training straight from the manufacturers, trade seminars & shows, literature, videos, and exams. Labor also consists of time to install parts and materials, overhead, liability, insurance, and operating expenses. Same as any other business, to provide you top quality service and customer support at an affordable price. We offer reliable appliance repair service at a very reasonable price. Also, A-Appliance Xperts prices its labor at a competitive market rate. Family-owned and operated for over 35 years, we stand behind our family name and service. Sales tax is collected on all physical parts, materials & supplies used to repair your broken appliance, in ordinance and required by IL, WI, and IN state law. We do not charge a tax on the labor or service portion of the appliance repair job. Tax is only collected on the physical parts & materials. *Not combined with any other offer. MUST mention coupon AT TIME of service! Leave and Read All Our Reviews!